La Crosse encephalitis (LAC) is the leading arboviral disease among children, and was previously limited to the upper Midwest. In 2012 nine pediatric cases of LAC occurred in eastern Tennessee, including one fatal case. In an attempt to identify sites near an active LACv infection and describe the abundance and distribution of potential LACv vectors near a fatal LAC case in the Appalachian region, we initiated an end of season study using a combination of questing and oviposition mosquito traps placed at forty-nine sites consisting of cemeteries and houses within 16 radial kilometers of two pediatric infections. LACv was isolated from three Aedes triseriatus pools collected from cemeteries and spatial clustering analysis identified clusters of Ae. triseriatus and Ae. albopictus populations that overlapped in the same area as the 2012 LACv cases. 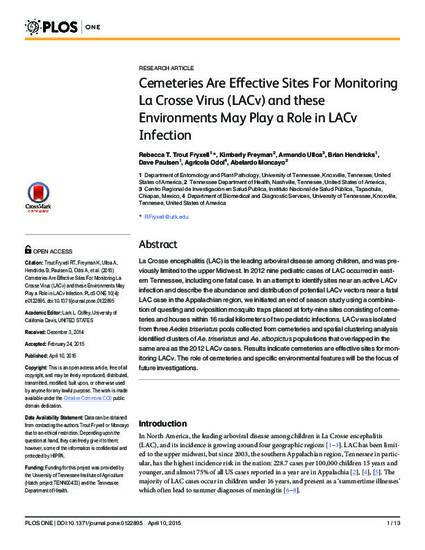 Results indicate cemeteries are effective sites for monitoring LACv. The role of cemeteries and specific environmental features will be the focus of future investigations.